A fast rush, a photo by The Bacher Family on Flickr. 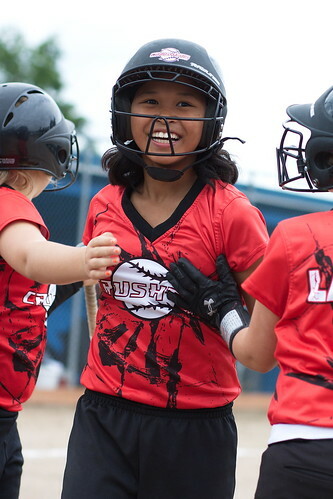 This is one of my favorite images from the whole Fastpitch Tournament. There's just nothing that conveys the euphoria of a great play, a great game, and ultimately winning a tournament like the look on this young lady's face, and the congratulatory hugs and high fives and accolades she earns as she returns to the dugout. Her shirt says "Crushers," by the way, but I love that all you can read is "RUSH."